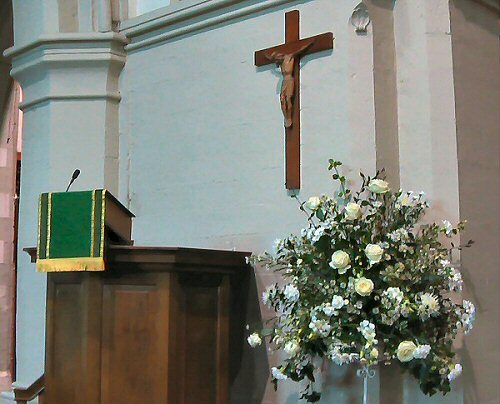 As from 1st September 2002, David Oliver took over as Director of Music at Leatherhead Parish Church from Chris Slater. 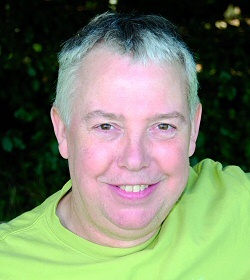 David, who was from the North East, had lived in Leatherhead since 1992. He was a composer & writer, specialising in childrens music  writing for BBC TV, GMTV and many holiday companies within the UK & Europe. He was a professional musician for over 25 years, and was formerly organist at West Rainton in County Durham. 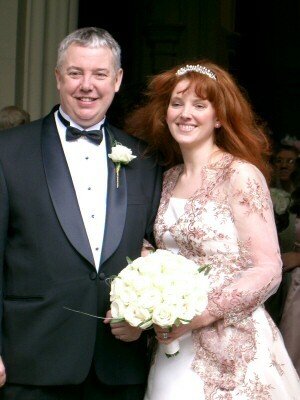 He and Debra were married at Leatherhead Parish Church on 20 August 2006. 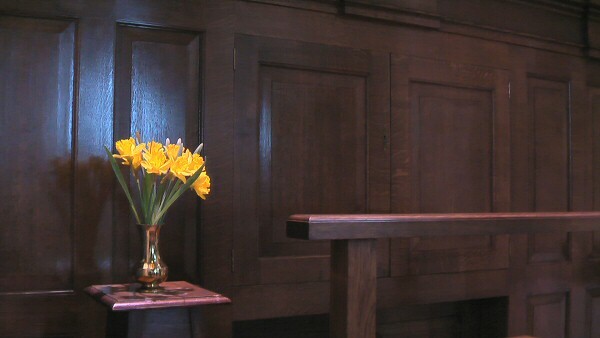 His funeral took place here on 5 Feb 2009. It was a moving celebration of a full life which had achieved so much, and which had so much more yet to give. David and I were deeply touched by all the amazing love, support and kindness that we received from our family and friends during the last twelve months. Knowing that we were not alone but surrounded by your love through every difficult step of our journey gave us enormous strength and courage, helping us both to continue. All the beautiful cards, letters, emails and also the messages posted to his 'blog' gave us many happy, cherished moments. So many acts of kindness brought the light of pure love to the darkest days. I thank you all on behalf of David and I with a full heart. Special thanks today to all those taking part in this service and to those who have given so much of themselves to make this day a happy celebration of David who we all love so much. I would like to offer my condolences to Debra, Dave's wife. To his children, Kirstie and Kristofer: Dave's family from Houghton; and Debra's family from Southport. We've all lost a very dear friend. Dave is someone we will miss very deeply. When talking about Dave, it's impossible not to mention Debra in the same breath. Debra has also lost her best friend, a husband and her musical partner. They have lived and worked so closely together for 20 years, and just as the pain at this moment is so intense, so I'm sure will the happy memories be equally as intense when Debra looks back and remembers their life and the happy times together. Dave touched lots of peoples' lives through his music, thousands of kids through his and Debra's Rory productions, the parents of those children who watched Dave's shows realising Rory was not just the usual holiday camp production, but productions filled with lots of great songs, ideas and characters. We will be reminded of Dave for a lot of years to come when we hear by chance one of his theme tunes on the TV, or the kids playing a CD, or a piece of Church music. The last few years Dave was involved a lot in this church, playing conducting and organising music here. Dave told me this gave him some of the greatest satisfaction and pleasure he had ever had from music. I've known Dave for over 20 years. He was at my wedding in Germany where he also acted as photographer, enthusiastically organising the guests in the correct order of appearance for the camera. And I was really impressed. It was only later that I realised this was largely down to Debra's dad's influence, Pete, a professional photographer. He also played organ at my daughter Elena's christening in Germany, secretly re-arranging a little tune Elena's granddad had written for her into a full blown organ recital. With that, for Dave small gesture, he made an old man unbelievably happy and proud. He was more than a friend to me and I think I was more than a friend to him. We were like brothers without all the family problems, we were soul mates. When we had problems or something major was happening in our lives, the other one would somehow sense it and get in touch. It was uncanny but it was really like that. We could sense what the other was feeling. I often told Dave how great he was, how talented he was, how much I and lots of people respected his work and thought a lot about him and how he had achieved a lot in his life. How proud I was of him and how proud he should be of himself. But somehow I had the impression in his striving for perfection and always looking for the next opportunity to further his career, he never really believed me. Debra and I told him all these things again in his last hours, and I think he finally really believed us. I think he realised he had achieved a lot with his life. And that somehow gave me a great sense peace. And just like all those other times when I sensed what Dave was feeling. This feeling of peace I was feeling, came from him. Dave, thanks for being my friend. As a small choirboy at his beloved church of St Michael and All Angels, David was so enthralled by the power and energy of the church organ that he decided he wanted to learn how to play it. Right there in that moment Davids love of music was born. How grateful am I to have known such a gifted, talented and spiritually attuned man. I am privileged to have shared his journey through life, and blessed to have shared his music. Listening to our favourite songs would lift us both on bad days; creating music with each other was truly special; most importantly the power and potential healing that music can bring to any soul, was discovered together. We all know that David enjoyed running his own band in his youth, that he excelled in arranging and producing well known songs for many happy listeners, that he was thrilled to write songs for children across the UK; especially when so many children wrote to him to say thank you. But what many of you dont know is that David never felt like he had made much of an impact on anybody, that he always wondered if he had made a splash in the vast ocean of life. Well David, you did, you really made a splash and you were loved for being you. You are loved still. I came to realise that Davids desire to reach out for music that day as a small choirboy eventually brought him back to the music he loved most, music that would mean everything to him and to many others. For by Gods grace he began work here at St Mary and St Nicholas Church, as Director of Music and I know this took his musical gifts to a much higher level. 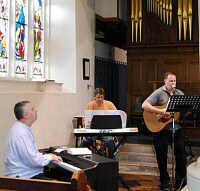 It became clear before long that the music David began to write for the choir, music group and congregation here at this church was his life passion. He would sit for hours in our home working on anthems, songs, and settings. Then he would hurry out of the house saying, I have to catch the printers, we are going to rehearse this tonight!. His eyes would light up, his smile beaming, he would be so very excited that he could hardly wait to hear his music come to life. When it did, it was truly heaven sent. It was then that Davids musical talent and ability shone like the brightest star. David and I always felt that during the writing process something much bigger than either of us would inspire us and we felt we were channelling music from a much higher source. I know this made him feel humble, that he was in awe of Gods gifts, that really he had found his heaven here on earth. Everybody shared in his music as we sang it and played it. We listened to his music and were deeply moved by it; and though heaven sent it has to be recognised that Davids certain style, his own special magical, musical touches made his music hit us all right in the heart. How blessed we are to have known you David. How you have enriched all our lives. We thank you. So of course we will all remember Davids beautiful smile, we will all remember his sense of humour, his laugh, his sensitivity, his wisdom, his spirituality and we will all remember his positivity. We will forever enjoy his wonderful music and we all know he will live on with us each time we sing his lyrics, or hum one of his melodies. But I ask you now to take a moment to remember Davids amazing courage, his strength, his bravery. He quietly fought a long and difficult battle to stay here with us, never giving up; always having hope; always writing music. For David still had so much more music inside of him that he wanted to write, that he wanted to share. During recent months he wrote some of his most inspired works; you will hear them today. David had so much to give, so much love and music inside him that now he will be sharing it with choirs of angels, of this I am sure. We love you David, we are so very proud of you. Your star will keep shining and we will hold you in our hearts forever. Davids death has come as a hammer blow to all of us who knew and loved him and to the life of this church, where he has been an inspirational Director of Music. We extend the sincerest of sympathies to Debra and Kirstie and Kristofer in their loss. Dex has spoken movingly of David and with great affection about their friendship which goes back many years. I would like to try and give snapshots of Davids life and the many things which were important to him. It is a life rich in accomplishment and a great deal of talent, hard work and ability; a life which loved life and all that there is to be discovered and enjoyed. You may have noticed that David was a Geordie. He grew up in Houghton-le-Spring, County Durham, and it was in the Parish Church of St Michael and All Angels he first learnt to play the organ. He quite often spoke of that time. It was clearly a very important and a formative beginning. It was from there that he went to Music College and his career took off. If youve been on a Haven Holiday you will have seen and enjoyed David and Debras work. David was involved with Haven for 20 years. He put their annual show together  composed the music and wrote the numbers  which were performed in their holiday camps. After 20 years it was probably time to move on  as David said there are only so many songs you can write about bananas!. However it has been a hugely important part of Davids life with Rory the Tiger and all the other animals the kids loved. They put in a special appearance at David and Debras wedding. David also did the cruises and was proud to have played the QE2. He was Musical Director at The Hilton on Park Lane and at the National Theatre for the David Hare Trilogy. He was also MD for panto at Christmas and played for many big names in the musical theatre world. Kids tv featured but latterly, although he would always be at home with light entertainment, he had become more focussed on the Anglican choral tradition and hence the pieces, like Psalm 150, which we are hearing today. It is part of the tragic irony of Davids death that as his health got worse he seemed to be more inspired. David loved Cathedrals. Because he was from the North East, naturally Durham was top of the list. If youve been there youll know its a great red-stoned imposing edifice on raised ground, hugely evocative and mysterious. All this appealed to David and drew out the music and faith within him. But as well as Durham, Liverpool (not dissimilar in style and equally imposing) pulled at his heart strings. A member of Debras family helped to lay the bricks. And then there was St Pauls in London and Saturday Evensongs  a kind of preparation for services here on Sunday. Church and Cathedral visiting was a feature of David and Debras travels, be that St Peters Rome, the Holy Sepulchre in Jerusalem, or a discovered favourite church whilst travelling in America. David had a lot of energy. He used to knock off 100 lengths or one mile at Cannons. In fact rumour has it the reason that Cannons has changed hands recently is because they couldnt make ends meet when David wasnt able to be around so much. He was also an accomplished sub-aqua diver and made me very envious with descriptions of dives in the Red Sea and elsewhere. For him this was all part of the richness life had to offer: he was daily on the NASA website, would rush outside to see the International Space Station go over. He loved ornithology, garden birds he spoilt rotten, and flowers: white roses and daffodils because they shouted new life (hence you have received on entering church today). I used to get it in the neck from David because my computer skills are very plodding: Davids were state-of -the-art. An essential part of his work and a part of him, like breathing. Of course you had better make sure it was an Apple Mac you were using  he had no time for any of the other rubbish on the market. Debra tells me that one Christmas they joined the Salvation Army Christmas Day Refuge as volunteers. David arrived with rubber gloves prepared to do the washing up, if you can believe it, but when they walked in they discovered that the TV was out of action. So it was off with the Marigolds an in with an old piano standing in the corner. He said: Looks like we have been sent here today to use the gifts we have been given. So he played and Debra sang: he even did a bit of washing up; and a great time was had by all. Which brings us back to Davids music. He was a great musician, with a huge natural talent. And the outstanding thing for me about David as Director of Music was that he was equally at home with classical and popular music, whether playing, writing or conducting. A rare gift. Thats why we are hearing both in this service. Our choir and Music Group owe a great deal to his inspiration and leadership. Like all good Directors of Music he didnt mind laying down the law, but mostly, like the softy he was, he loved them and encouraged them, and they loved him in return. He brought musicians together and made it work. 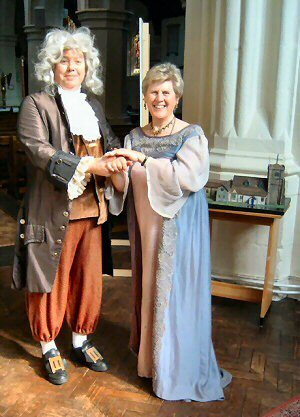 He was particularly delighted with our 18th Century restored Thomas Parker pipe organ  as he said a fantastic 50th Birthday present. Here he was able to indulge his love of Handel and Purcell and West End Music. But he could also move on a pace on the electronic keyboard and grand piano, when he swung into easy listening and the popular standards or the new wave of Church Worship songs. And it wasnt all about him. He was Director of Music. He knew how to bring out the best in others and to make sure the music gelled and had the right balance. 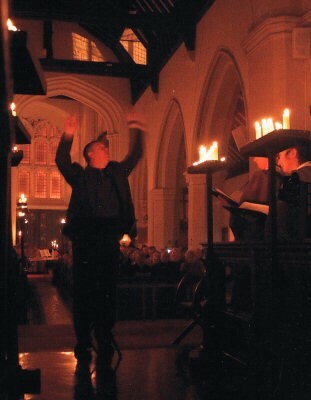 Nowhere was that more evident than in our annual Nine Lessons and Carols service which David had made his own. 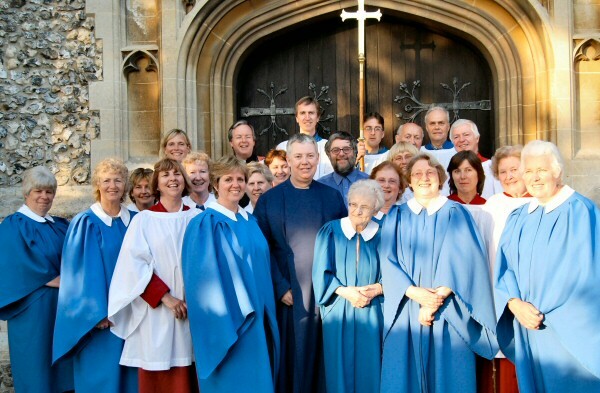 A unique blend of old and new church music, the congregation for which in the last few years has, I think, trebled. He was also a composer. We are hearing his work today. I kept on at him to get it published and promised him, towards the end, that I would pursue publication in his memory. It deserves a wider hearing. Many of the pieces were written for specific people, or choir or group and were Davids way of saying you matter to me and this is how I show it. His death is a tragic loss in many ways. One of them is the music he had in him which was yet to be written. David was, of course, very human. He wasnt perfect and he wouldnt want me to say he was. Things hadnt always gone well or gone right. There may be regrets. Forgiveness may be needed. It all meant that David wore his heart on his sleeve and that is part of what was endearing about him. All of our lives are broken in some way. There is huge expectation in our culture and a good deal of finger pointing when things go wrong. The reality is that none of us is fully mature or whole. We often do the best we can, but even so things fall apart. David was vulnerable but we loved him for it. well you get the picture. But actually quite a lot of the time, when we were together, we spent sharing what was getting us down. There are too few people you can do that with. Having a place to be yourself, and say it the way it is, is important. I will always remember David as someone willing to share his own frailty, and mine. It was in this way he was devoted to those closest to him: Debra, Kirsty and Christopher, immediate members of his family and Debras, and also to many of us who were his friends and he ours. The waters of friendship ran deep. Because his death is so premature it is hard to grasp. Can it really have happened? He fought to keep going. He wasnt going to give up, or give in. He had found Princess Alice Hospice a great support. This is equally true of the Queenscourt Hospice at Southport, where he died, with Debra and Dex at his bedside. And of course he made his mark there: by playing the grand piano for patients and staff, a final curtain, and hugely appreciated. Monies given in Davids memory will go to Queenscourt (you may do so as you leave). There had been no music there before David, to speak of, so these donations will be used to provide an Ipod for each patient who can then listen to the music of their choice. I am thankful I was able to hear much of the music we have heard today before this service: otherwise I would have been on the floor. It is all too much, and all too much David, as we knew him and loved him. The most telling line in the story of the raising of Lazarus is Mary and Marthas: If you had been here our brother would not have died. Both affirmation of Jesus and his power to save, and yet reproach and anger that Lazarus was now dead. Which is, of course, so much of what we are all feeling today. We have lost a husband, a son, a father, a close relative, a dear friend. We have lost a man of great ability and talent, a gifted musician and conductor. When Lazarus died Jesus wept. The Jews said: How dearly he must have loved him. Jesus said: Did I not tell you: that if you have faith you will see the glory of God. It is for this we pray, as we honour Davids memory today, thankful for all that we received from David; thankful to have known him and loved him; blessed to have shared life with him. His legacy will always live on; his memory will always be cherished. Crematorium for immediate family and friends. for refreshments following the service. Funeral Directors, Worple Road, Leatherhead. and lovingly produced the DVD Montage of David with the song I wrote called 'I Will Try'. There are plans to make available the short DVD of David's life shown during the service. If you wish to be kept informed when it is published please contact the Parish Office stating David Oliver DVD. of the service on CD, proceeds to the Queenscourt Hospice. If you wish to be kept informed when it is published please contact the Parish Office stating David Oliver CD. Family, friends and congregation came together in a most moving way to celebrate the life of David Oliver, the church Director of Music from 2002 until his death on 13 January 2009 at the age of 51. His funeral service on 5 February lasted nearly an hour and a half  almost unprecedented in the Anglican tradition, and at times was almost like a concert, with the congregation bursting into spontaneous applause. Much of David and Debra's music was included in the service, some of it for the first time. The church was full in spite of the fact that the heaviest snowfall for a generation a few days before meant that many people were unable to attend. David's untimely death on 13 January was a great blow to the choir. He was a delight and a challenge to work with; he was an inspirational leader and had professionally high standards from even the least experienced singers. He first came to our notice at an open meeting in 1995 held to discuss the future of choral music in our church, when he, a complete stranger, stood up and suggested that he could take on the role of music director. In the event, he did not pursue it at that time, but he eventually took up the position of Director of Music in 2002 following Chris Slater's retirement. By this time he had already written some pieces for our choir, and he was to write many more over the next six years. David had so much music inside him and we could often tell his mood by whatever he was tinkering away at whilst we sorted ourselves out. If we sang well he would occasionally give us a nod: praise indeed! If not, he would come down to the vestry and ask us where we thought it had gone wrong. His particular strength as a composer was that he could tailor his music to the voices available, so there were soprano descant or obligato passages for Claire, and the alto section were often challenged by tricky intervals or off-beat entries. He was often great fun to be with and had several pet phrases we could quote in our sleep: "thar's now't like a good start" and "that was nothing like a good start", or just "you're late". His most frequent one was "no rall" if we inadvertently slowed down in places through the piece. We heard this so often that one year we created a carol entitled "No rall" set to the tune of The First Nowell. If he was bored during a long sermon, he would slide slowly diagonally off the organ stool and pretend to snore on the floor; he used to pull faces at us across the aisle and keeping a straight face was often the biggest challenge of all! David seemed equally comfortable with the large-scale pieces like Psalm 150 sung at his funeral and the simpler Taizé chants which we sing during the Communion or at the Evening Reflection services. These simpler pieces have become special to us, and were to David too. He often played musical games, playing film themes or other well known tunes concealed within the ecclesiastical recessional pieces the congregation heard. Then he would come bounding down to the vestry and ask, "Well, what was it? Did you get the tunes?" As a music group, some of us got to know him even better. Every time we sang with him our singing always improved. Even the most mundane hymn tune in his hands would become a snazzy little ditty! We met at each other's houses and over a glass of wine would work on the same phrases over and over until he was satisfied. Recently, David and Debra wrote a piece especially for us, Worship and Praise Your Name, which we sang at his funeral. He had composed the outline and brought it to a practice session, then as we were learning it, he gave us further instructions: "Claire, sing this-, Julie, sing that; Doug, this rhythm-, Martin, those chords". Rapidly it transformed from a framework to a whole multi-level composition. Over the last year or so David was often in pain but he was determined to carry on as long as possible. Even then, he hoped to be back in the New Year, but sadly this was not to be and his passing has left a gap that will be difficult to fill. His funeral on 5 February included a number of his own compositions and we were glad to welcome fellow singers from Christ Church URC, Leatherhead Methodist Church, Mickleham, the Pilgrim Singers, Carol and Martin Coslett from Betchworth and "extras" from our own congregation. We are grateful to Paul Dodds for conducting and rehearsing the augmented choir and to Geoffrey Harvey and Peter Holt who shared the organ playing on the day. David was a good friend as well as a talented leader. It really is hard to believe he's gone, but he will live on in the music he composed and the skills and confidence he gave us. Hedley Kay: When David first joined us I particularly remember the time when a small group of us were singing a new worship song in church when David came up afterwards and said he was "within an inch" of joining us. His enthusiasm and real love of music was obvious from this encounter and the Music Group was very fortunate in having several years under his skilled leadership. I will never forget him and his many gifts and will always treasure the memories and privilege of being able to work alongside him. Linda Heath: David had many facets to his life and we shall all remember different ones. What stand out to me are his musicianship and the warmth of his personality. As a fellow musician, I had a great regard for his talent, and he was also a very good friend to me. How fortunate we all were to have such a talented and versatile Director of Music  he will be missed by all who knew him. Roger Lynch: Janette and I will especially remember David for the beautiful anthem he composed for us last year and for the musical encouragement he gave to our Peter when he was at the Parish Church. Peter Leith: There are several great memories. He was the "Master of his Music" and an inspiring musician to work with, possessing that essential sense of humour! One rehearsal stands out, however. The basses probably received more criticism than any other section of the choir. Perhaps it was justifiable! On one memorable occasion, a difficult Psalm setting was being rehearsed. David called out, "What planet are the basses on?" After struggling with the relevance of singing the merits of "Johab's washbowl", I replied, "On Mars, the bringer of war!" David was amused, the psalm was finished and performed to the wishes of Johab, and the basses escaped criticism until the next rehearsal. Happy times! 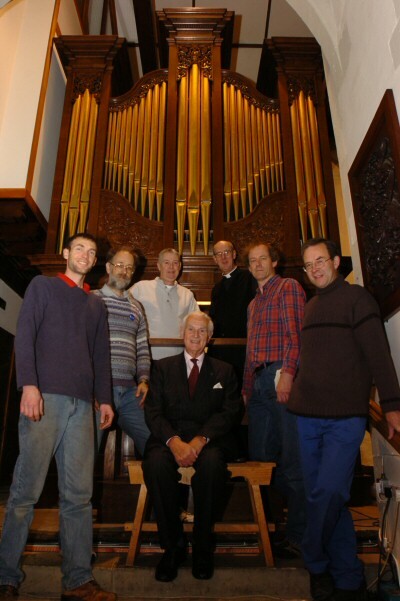 Frances Presley: I shall always remember his enthusiasm when the reconstruction of the Thomas Parker organ was suggested, the eagerness with which he watched its installation and his delight when he could actually sit and play it. It happened to have been installed very shortly after his 50th birthday and, as he said, the best birthday present he had ever had. 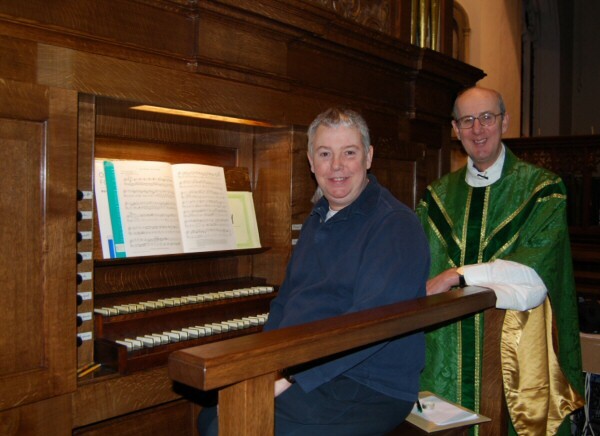 Such was his affinity with the organ that, a few hours before the Organfest started in November, he rang me as he left the hospice in Esher to see if he could come into the Church and see it, as he knew that he would otherwise have been taking part. That must have been the last time he saw it, and maybe even come into the Church. As his friend Dex said in his tribute, David always underrated his own abilities, and it took a lot of persuasion to get him to play even a short piece to open the inaugural concert as he felt that he would not be able to do it justice. How wrong he was in that, and what a legacy of music he has left us. 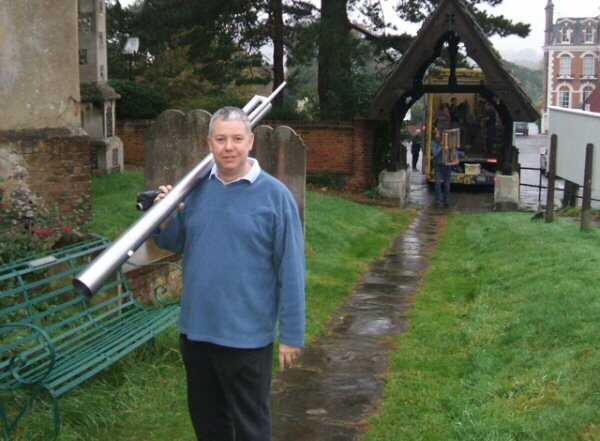 Peter Ford: On Sunday 8 February a quarter peal of Plain Bob Major, consisting of 1264 changes, was rung in thanksgiving for the life of David Oliver, Musical Director, Organist and bell ringer. Treble, Jenny Gordon; 2, Ron Deserens; 3, Rosemary Henderson; 4, John Aronson; 5, Peter Ford; 6, Rex Woodland; 7, Bill Hibbert; 8, Quentin Armitage, who also conducted. David Oliver Memorial Concert What a wealth of talent! Both from the Pro Corda Baroque Ensemble and from Graham Thorp, organist. They were the performers at the David Oliver Memorial Concert in the church on Saturday 17 October. The Pro Corda group consisted of a small ensemble of only six players, all music students, led by Rhiannon Randle, aged 16 years. They were absolutely first rate, without having to make any allowance for their youth. The programme featured works by Purcell and Handel, both of whom have anniversaries this year, and a very short work by Rhiannon herself which, again, was superbly played. Meanwhile, what of Graham Thorp? 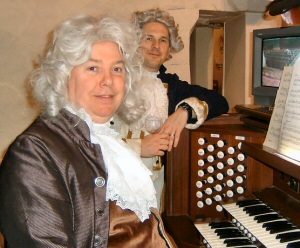 Before playing on the Thomas Parker organ of 1766, he spoke about it with such enthusiasm and affection that it was a delight to have a soloist who thoroughly appreciated what a fine instrument it is. He also explained about the sounds and effects of some of the stops he would be using  trumpet, bass horn, etc. Both his solos and the two Handel concertos were a joy to hear, and this was in no small part because he had taken the time and trouble to put in a lot of practice on the instrument to become really familiar with it. Our thanks go to him and to the talented Pro Corda ensemble for a most enjoyable concert which was very well attended. The concert raised £1,070, which will go to the Queenscourt Hospice in Southport, Lancashire, where David spent his last few weeks. This money willgo to the Queenscourt "Music for Patients iPod Fund" to buy iPods with suitable equipment for the patients so that they can each listen to as much music as they like. What a fitting memorial to David. It feels like only yesterday that David and celebrated our wedding day with you all and yet life has taken me upon the longest journey since that happiest of moments. I know many of you are aware of the musical project so close to my heart that I began to work on shortly before David died. The album Child of The Universe is about my life journey, the experiences that have shaped me, the searching questions that I have had on my personal journey so far and the understanding that has brought me to know God and myself. I hope that the songs both musically and lyrically will bring strength and courage to others and will also help to shine a light of hope and happiness to everyone who hears it. I will be performing all the songs from the album with the musicians who recorded it with me (all friends of David and I), on Thursday 21 October at The Leatherhead Theatre as part of the Arts Alive Festival and I hope very much that you will be able to come along and join us for what I know will be a lovely evening. I also hope to raise money for Princess Alice Hospice where David stayed briefly. If you wish to add your recollections of David to this page please contact Frank Haslam, the editor of these pages.